February... It's not the most inspiring of months. It's still bitterly cold, windy and rainy, but the sun isn't setting until at least 5.30pm *fist pump*. Spring is practically whispering in our ears. However, let's not get ahead of ourselves. If, like me, you live in England at the moment, you'll know about the battering of storms we've been having. Therefore my ultimate February outfit is this gorgeous combo. The Tweed Faux Fur Collar Coat from Warehouse - because that furry collar looks so damn cosy. The Washed Black Baxter Jeans from Topshop - because washed black is excellent casual take on classic black jeans. The Boat Neck Stretch Cotton Shirt from Esprit - because I literally can't get enough of striped shirts. Literally. The Neutral Western Boots from Next - because neutral boots are flatting and definitely in right now. The Twin Bag from Prada - because it's PRADA and its YELLOW! No need for further explanation. 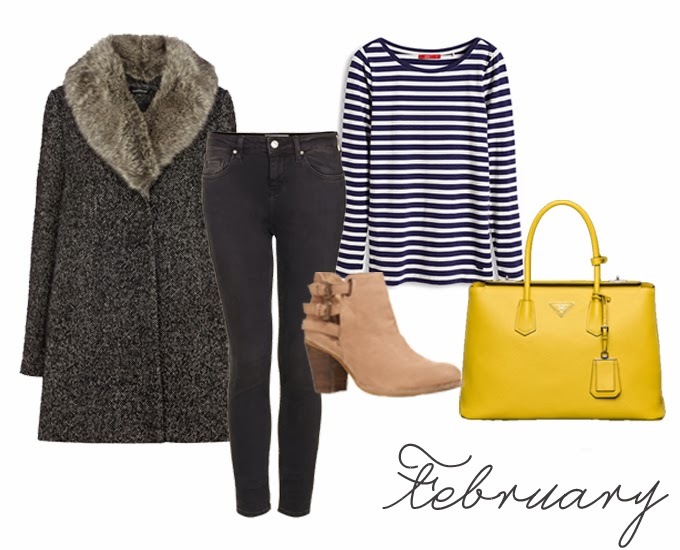 Would you wear my February outfit? What do you think of it?